Remember when you were young and impressionable? When you would shriek in horror as your uncle presented you with ‘your nose’ between his fingers – aka his pokey-through thumb? Or, you would glibly give over all of your pocket money to your smirking brother to collectively buy something ‘really great’ for Mum’s birthday (because “two allowances are better than one. Mum deserves the best”)? Mum of course got what she always got, a sweaty box of Russell Stover candy and a hastily drawn card, while brother suddenly was in possession of a new skateboard. * Hmm. Or how about when, after an indulgent day at say, Florida’s Sunken Gardens, you would badger your exasperated parents for a $2 can of Florida Sunshine? How could we have fallen for all that? I mean, really. Of course today’s children are far too sophisticated to be duped. Or are they? Actually they are just as credulous. In fact, a very grown-up, very cool friend of Miss R just in the past year – and I witnessed this with my own eyes and did try to remonstrate – spent £4 on ‘Irish Accent’ spray. And yes, she really believed it would work. She thought that by spraying this minty air into her mouth out would pop an Irish lilt instead of her rather fetching Aussie-Scots twang. She was crestfallen when nothing happened. It was kind of sweet really, this sophisticated, on-the-pulse girl actually acting her age, or even a bit younger. And her breath did smell nice. Today I am not testing your gullibility. I won’t be offering you the chance-of-a-lifetime investment in my goldmine in Beirut, or hawking a miracle pill to selectively target ‘those stubborn areas.’ I can however offer you Sunshine In A Can. Or rather, a jar. Glut or no glut fresh tomatoes can be eaten in countless ways, and ‘put up’ (the Southern phrase for canning) for later. But here’s another way of preserving and enjoying these sweet-salty orbs whenever you like. Your own personal sunshine in a jar. Without the knowing smirk from your elders either. 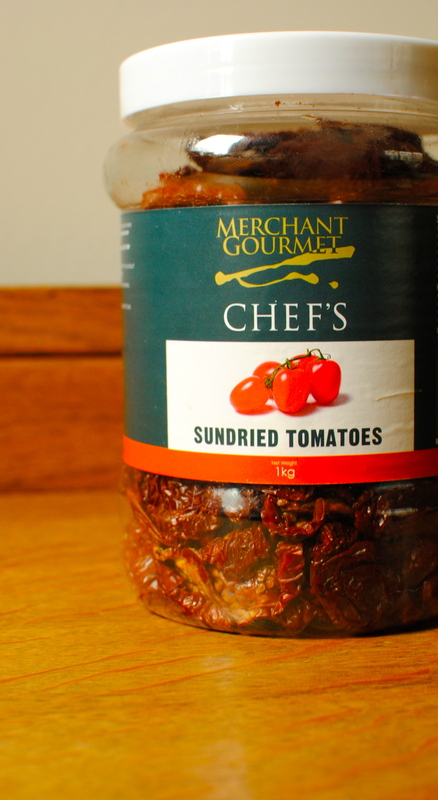 Like its antecedent the ‘undried’ tomato, sundried tomatoes are incredibly versatile and nutritious. Although you surely won’t eat one cup of these, this measure supplies about 21 mg of Vitamin C, 5 mg of B6 and 1,851 mg of heart-helping potassium. Lots of other vitamins, minerals, and also fibre and protein too. The big downside – and this can’t be ignored (and why you would never eat a cup of them) – is the sodium content. One cup gives you half the amount you should have for the day. And the oil-packed version leaves you with the gift of 234 calories and 15 grams of fat, versus 140 calories and 1.5 grams of fat for the un-oiled version. Always try get the plain ones and control the oil yourself. That’s what we are doing with this recipe. Oil is good with tomatoes, it helps us absorb some of the major nutrients (see below) but a little will do. On the hugely plus side is the presence of free-radical zapping lycopene. Tomatoes are the most concentrated source of this remarkable plant compound, with cooked ones – including dried – having even more more than raw. Lycopene is related to beta-carotene and is a member of the phytochemical group, carotenoids. The carotenoids are potent free-radical scavengers, meaning they prevent damage caused to cells by oxidation, whether from normal metabolic processes like breathing, or exposure to smoke, stress and chemicals. Read this article from The Atlantic for a good explanation of antioxidants and why they are so vital to us. And click onto the World’s Healthiest Foods for a good explanation of lycopene. Basically lycopene is especially powerful when it comes to protecting healthy cells from being damaged. There is limited evidence to show that lycopene from tomato products may be useful in controlling PSA levels in men with prostate cancer. Other cancers may benefit directly from lycopene, which is also found in pink/red grapefruit, watermelon and guava. See this piece on the American Cancer Society website for a good overview of the literature. Good reading. And now to the recipe. I have it here quick and simple on some toasted bread, with a little extra oil and some olives, but it can be used like the bought sundried tomato paste as a flavour boost for soups, casseroles, pasta dishes (this would be delish as part of a tortellini filling), in bread dough, mixed into salad dressing, as a spread on fish and chicken for roasting. It is also fantastic whizzed up with some cooked beans or soft cheese and some extra herbs to make a quick dip for veggies or pitta chips. Next post I will pop some into a special summer tart featuring an unbelievably easy and very different crust. Till then, happy harvesting. * PS Poetic licence was taken with one of the memories. Sorry Julie! Were you a gullible/impressionable child? Did you play tricks on your siblings? What are you doing with your tomato crop? Sunshine in a jar: to spread on anything and everything. Well, almost. 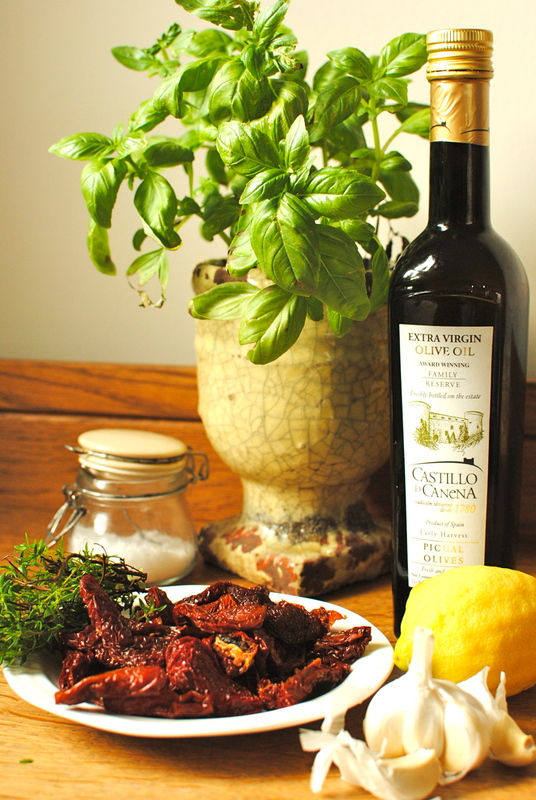 Tweak this how you like, include capers and/or anchovies for a more authentic tapenade, or use other herbs. I like it like this but it is really just a suggestion. It keeps well in the fridge for two weeks if covered in a layer of oil, or you can freeze it as is: the oil will keep it from going solid so it is easy to spoon out as needed. Cover the sundried tomatoes in just boiled water and leave for 20 minutes to soften. Drain and save a bit of liquid. Put the drained tomatoes into the bowl of a food processor and process until well broken down but not smooth. I used the pulse button so I could easily control this step. Now add everything else in but the oil and soaking liquid, and pulse or blend. You will need to occasionally scrape down the side with a spatula. When it is the texture you like – I like mine with a good bit of texture – add the oil. Check the consistency and, if you like, add in a little of the soaking liquid to thin slightly. Pop the tapenade into a clean jar and store in the fridge for up to two weeks (cover with a little extra oil if not using within a week) or the freezer for up to six months. Ignore the salt pot (below). I have no idea why I put it into the photo! mhmm.. i am a HUGE tapenade fan and became addicted to black olive, as well as sundried tomato tapenade when i was living in France! Your photos are amazing! so glowing!! Thank you Alexia. 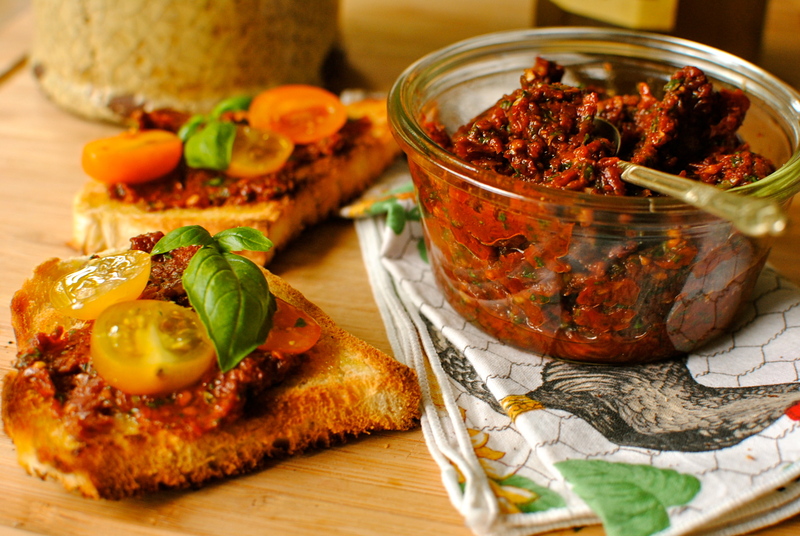 Sundried tomato tapenade is not the usual but I think it is most versatile than the olive one, especially when feeding children. I was just talking about making olive tapenade last night. 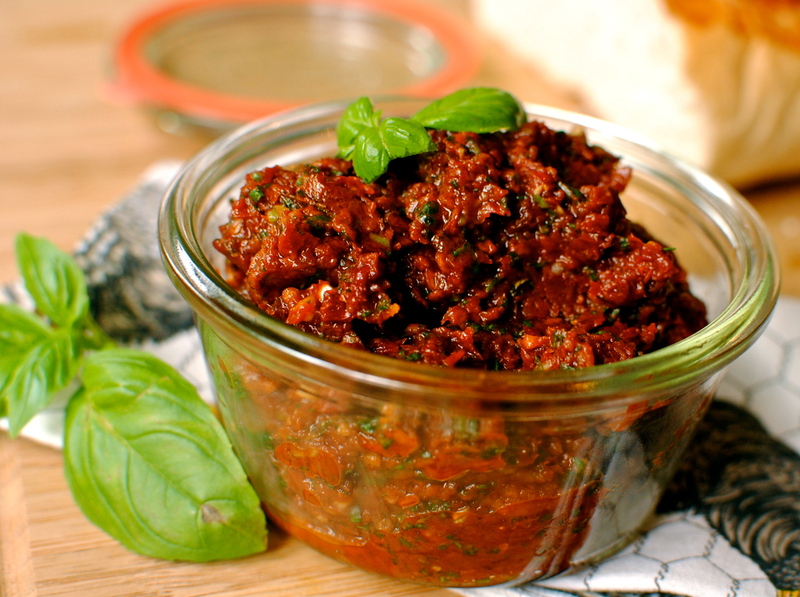 This sun dried tomato version looks and sounds amazing! And, yes, I was a bit gullible as a kid. That story about accent spray was endearing and it hit home. I would have done something like that but kept it a bit secret in case I was wrong. I still do stuff like this every so often. I’m charmed to hear you are a kid at heart. I wish I wasn’t such a cynical, suspicious so and so. Much more fun to be trusting! LOL Kellie, such a lovely post! 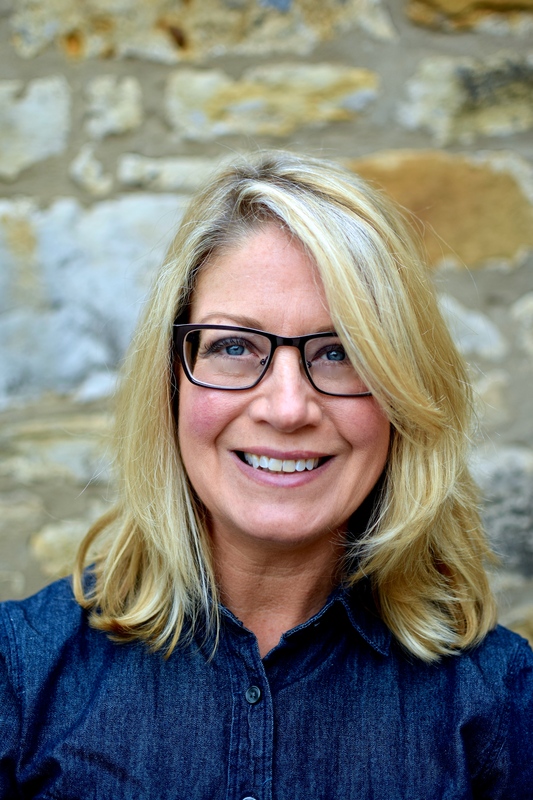 I was gullible and naive as a child and have only recently grown up (at 53!). Love the idea of this tapenade, sunshine in a jar, how lovely! With my green tomatoes, I made a beautiful salad. The red ones, we just ate them from the hand… wasn’t the best season. I sure miss growing tomatoes in abundance, out in the sunshine. Our tomatoes really need to be hothoused, which is cheating and not as tasty, in my book. I used to love fried green tomatoes with something nippy like a chutney or in a fresh bread roll. Tomatoes straight off the vine and rubbed of dirt onto your jeans was always the best. My grandmother used to get us to ‘grade’ them by size under the shade of her elm, while she shucked Silver Queen corn or podded peas. Lovely times. Yes, Mimi was so proud of her “beefsteak” tomatoes…and I haven’t tasted any better ones since the old days. Nice memories. Thanks Dad. Some of the food memories from being at Mimi’s are very vivid. If I think hard enough I can almost feel the crumbly red soil, & smell the fried chicken! I just can’t wait for tomato season! Each week at the Farmer’s Market I am hopeful, should be soon! Tomatoes are certainly sunshine in a jar and I adore the idea of keeping sunshine around even on a wet or foggy day. A lovely post! I hope the tomatoes are in this week. We are mainly getting Spanish & Italian ones right now but I am trying to buy British Isle of Wight ones – very sweet. Irish Accent spray is too funny! I was an overly-inquisitive child and not at all gullible (sadly, maybe). My mom still tells the story of when I asked her where babies come from and I told her in no uncertain terms that the stork story wasn’t believable (I had just turned 5, lol). Tomatoes are one of my favorite things about summer and this looks divine. Bookmarking! You sound like me! Old head on young shoulders. I eat tomatoes year-round except in winter, but summer crops are way superior. Only in the summer will I eat them raw, from a bowl on my desk, like sweeties 🙂 the cherry/grape ones. I too eat mainly fresh & really just use the dried ones for extra flavour in things. 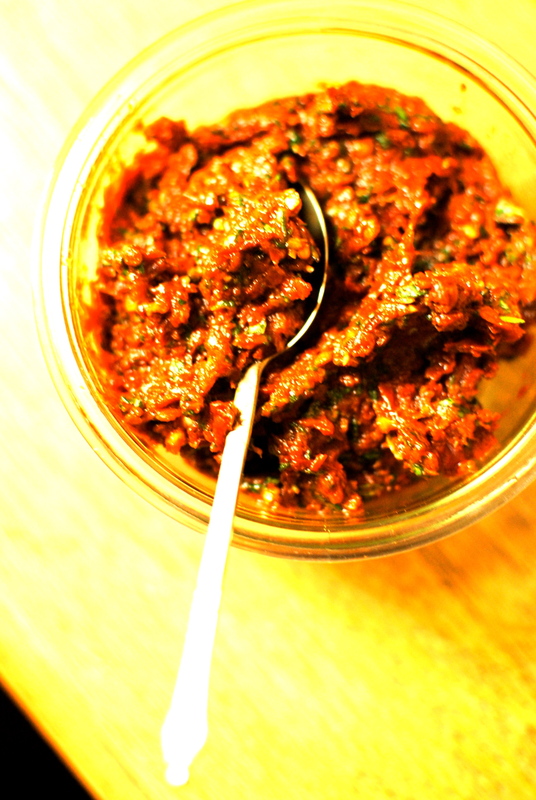 This tapenade can be used like a better (hopefully) sundried tomato paste as well as how I described. We think a like a lot! The comments were heartfelt, m’dear. Hope the blogoversary celebrations were fabulous. Mine was in February but I kept quiet for some reason. 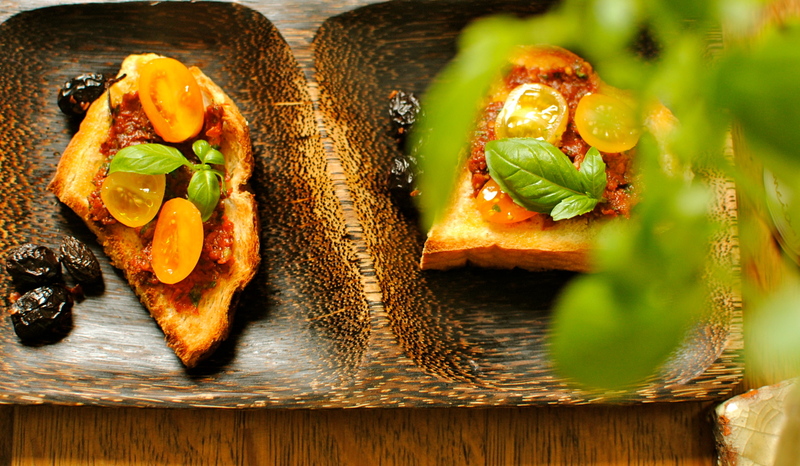 This is one of my favorite uses for sun-dried tomatoes. Thanks for the reminder to get my arse in gear and make some. I love to serve this over a bit of pasta with some shrimp and greens! 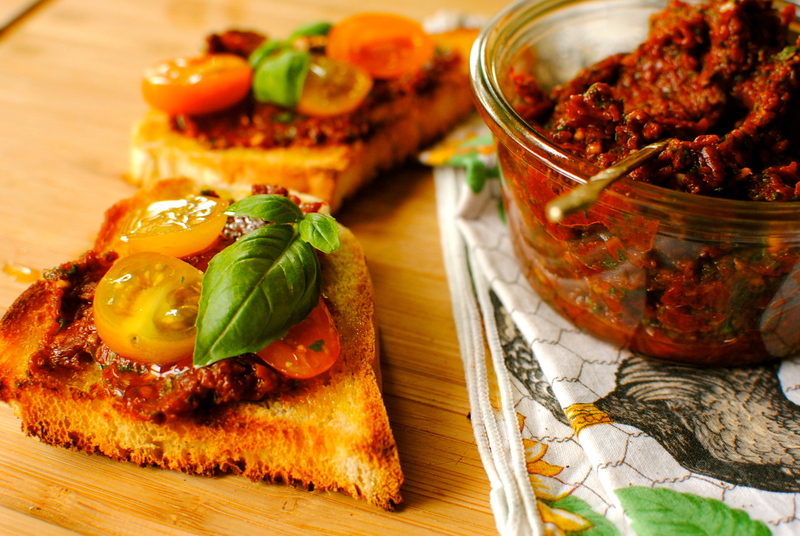 Sounds a great, simple way with tomato tapenade. I also do a green olive and coriander one that we love on fish and on potatoes for roasting. I nicked the idea from one I used to buy at Waitrose. You have a goldmine in Beirut, and won’t let us invest? Good thing someone in Nigeria (a cousin of the President, no less!) is offering the opportunity to make a tidy profit by transferring some money for him … should be enough for a big bag of sun dried tomatoes, which thanks to your blog, I will put to good use. Those Nigerian entrepreneurs get around, don’t they? Hope you like the tapenade. 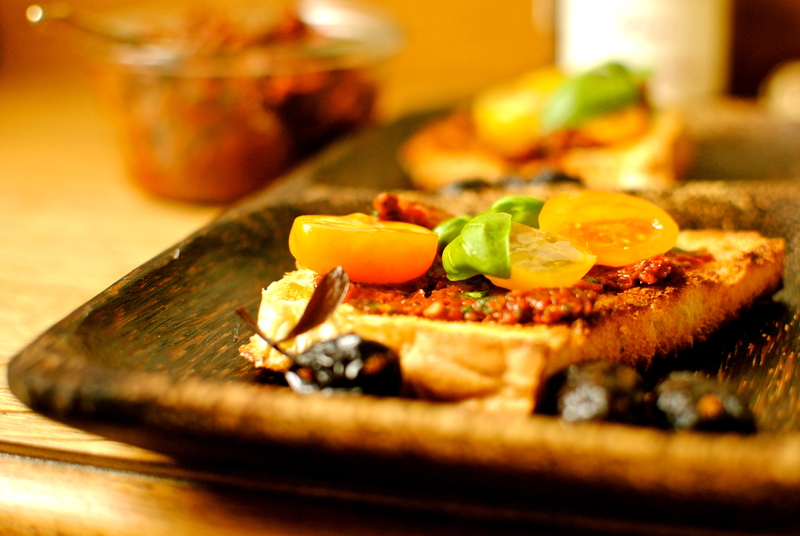 Try it on the Tomato and goats cheese pastry tart thingy. Great to hear from you.